We are delighted to announce that at the Goldsmiths Craft and Design Council Awards in February, Louise Sorrell of Sam James Ltd (pictured below) made a clean sweep, winning three awards. First she was awarded the Gold Award Junior in the Engravers, Die Sinkers and Seal Engravers section for her stunning masterpiece vase. Then Louise outshone the competition to win the Junior Award (which is chosen from the gold award junior winners across all sections). Finally Louise and her master, Sam Marsden, were awarded the prestigious Theo Fennell Apprentice/Master award. We would like to congratulate Louise on an exceptionally beautiful, wonderfully designed and skilled engraved piece. Her trio of awards was truly deserved! We would also like to congratulate Megan Rigby, apprentice at Rebus Signet Rings, who entered for the first time and was awarded the Bronze Award Junior. On behalf of the Hand Engravers Association, Malcolm Appleby generously hosted the International Hand Engraving Symposium at his workshop in Grandtully, Scotland, August 2017. One of the attendees, engraver and silversmith Miriam Hanid, recorded this unique event. Thanks to the support of the Goldsmiths’ Company and the Incorporation of Goldsmiths, we were able to edit and share the footage. 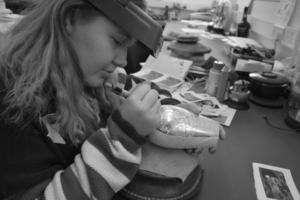 In 2012 the Hand Engravers Association of Great Britain was awarded a grant by the Heritage Lottery Fund to run a major hand engraving event as the first part of a larger archival project. The inaugural ‘Cut in Clerkenwell’ in 2012 was so successful that a further event was held in 2015. This was a two-week celebration of hand engraving with talks, workshops, demonstrations and an exhibition of the first Paperweights Collection created by members. Over a hundred people participated in the workshops including crafts professionals, students and the general public. Many more dropped in to chat to hand engravers and enjoy the exhibition of members’ work which demonstrated the wide variety and skill of British contemporary hand engraving. Griselda Bear was the Project Manager working with most members of the Association and a large team of volunteers. The project was funded by the Heritage Lottery Fund, Craft Central, The Goldsmiths’ Company, The Clockmakers’ Company and the Ernest Cook Trust. Following the huge success of ‘Cut in Clerkenwell’ 2012 a second, week-long event was hosted in 2015 with the generous support of The Goldsmiths’ Company and Craft Central. This comprised an exhibition, demonstrations and taster workshops of hand engraving. There was also a trade consultation ‘Training the Trainers’ to assess the needs of the industry and discuss how to move forward.